My first autumn design to be released into the world this August was Barbicel in Pom Pom Quarterly's Issue 22. Barbicel is a long open cardigan, a great layering piece for your autumn wardrobe because of the lightweight fabric created by Holst Garn's Supersoft 4ply. This was my first time designing a cardigan and also my largest design yet. I thought I would write about the development of Barbicel and then do a little something fun for my followers and readers. Each year I anticipate the moment when Pom Pom opens up their submission calls for their autumn or winter issues. Their mood boards are always a rich source of inspiration and I was particularly excited about this one when I heard Juju Vail would be Pom Pom's first guest editor. I met Juju through Pom Pom when I first moved to London and had the pleasure of working with her as my photographer on my book, Take Heart. Juju's life is incredibly colourful. Her personal style and artwork are only a few examples of this. She's always pulling together fantastic colour combinations with wild textures. When Juju is around, fun and laughter are not too far behind. 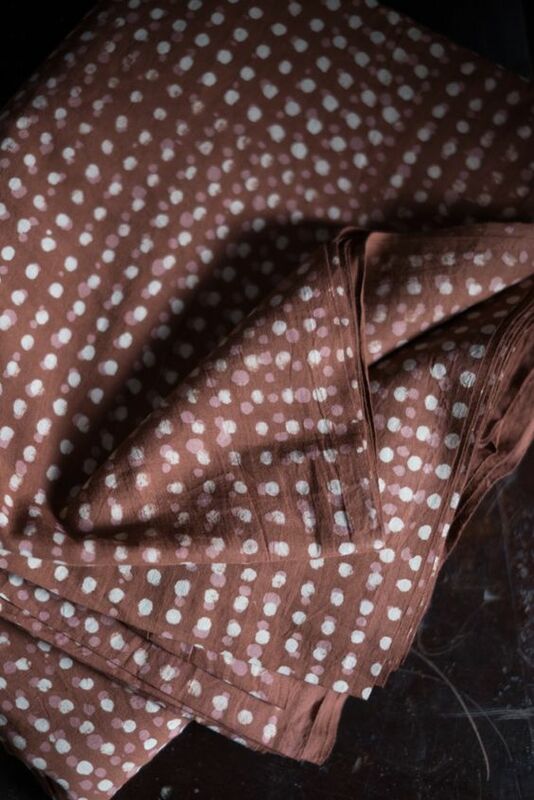 Fabric from Merchant & Mills. This autumn's mood board was full of images of saturated autumn colours, heavily patterned textiles and many layered looks. 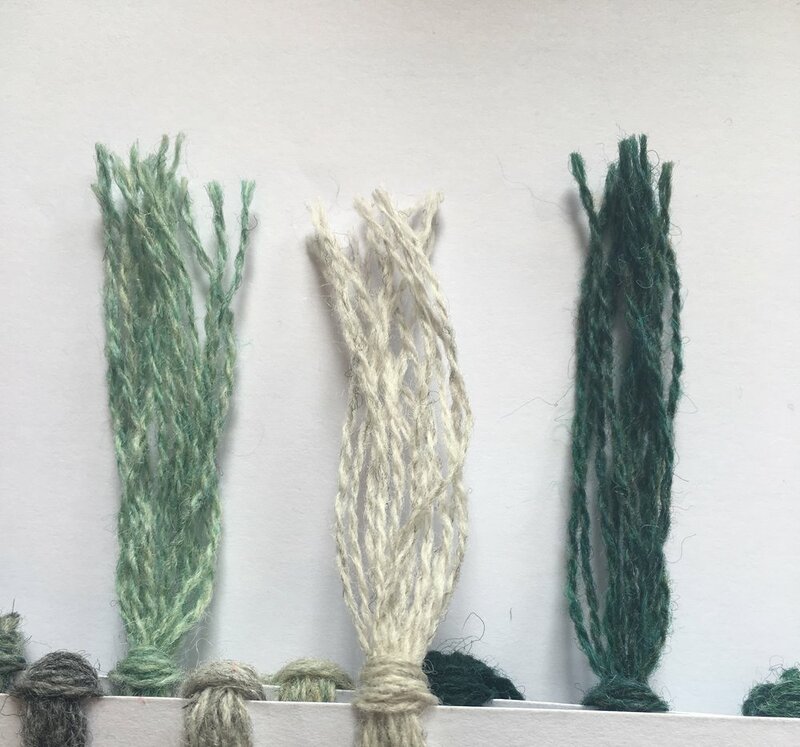 I was immediately drawn to the fabric samples stocked by Merchant & Mills. I often look at printed or woven fabrics as a source of inspiration. I enjoy seeing how I can reinterpret them as a knitted fabric. Since there was such rich colour on the mood board, I thought that creating a tiny, repeated motif through stranded colourwork was the direction I wanted to go in. At this point I was working on my first two sweater designs for The Fibre Company and thought maybe it was time to design a garment for Pom Pom as well. Above is a photo of my original swatch compared to my final one before casting on the cardigan. As you can see it is quite different in appearance. My original swatch is knit with smooth sock yarn. I had suggested Holst Garn's Supersoft as a possible yarn but had to go up a few needle sizes so it wouldn't be too dense and would allow the yarn to bloom after washing. It was a tough time picking out the yarn since Holst Garn has such a large colour palette. However, with some help from Juju we were able to narrow it down to Holly, Spring and Nougat. The Holst Garn is incredibly lightweight but still warm since it is 100% wool. The front sections still have a lovely drape even with the amount of stranded colourwork happening. Barbicel also started off as a vest but at Juju's request I added sleeves and hopefully created a perfect layer for your autumn wardrobe. Since I'm working from Nova Scotia right now, it is no big deal to have to send pieces to the UK, the States or even Japan. However, you may be surprised to hear that this cardigan made a few trips across the globe before it was even released. The knitting happened here in Canada but I had planned to travel to Helsinki to spend time with my partner, Eero, at the end of May. 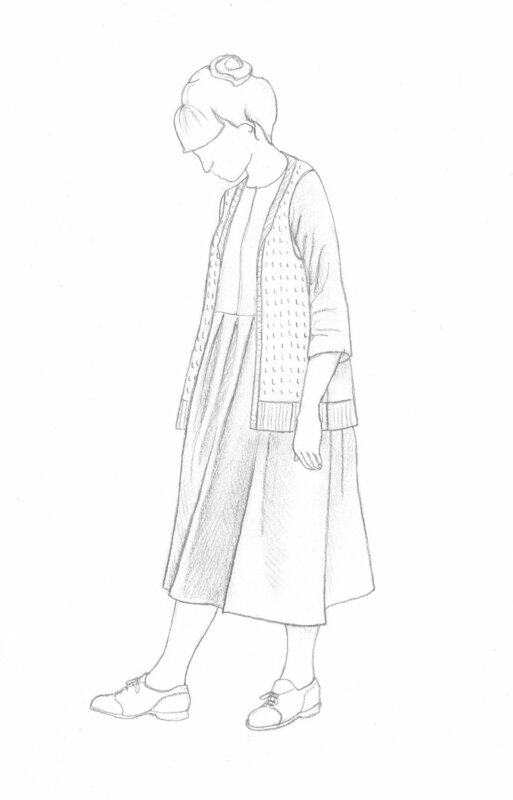 The cardigan was finished but the written pattern and grading was not yet ready. I carefully packed it in my hand luggage and made the long trip to Finland. While I was in Helsinki I took a few mornings to finish up the last of the computer work. I picked out a Moomin postcard, of course, to accompany the cardigan before mailing it to London, UK. where it was eventually packed up again and taken back across the Atlantic to be photographed in Austin, Texas. Before I send a design off anywhere, I always take some photographs of it just in case I need to reference them later. 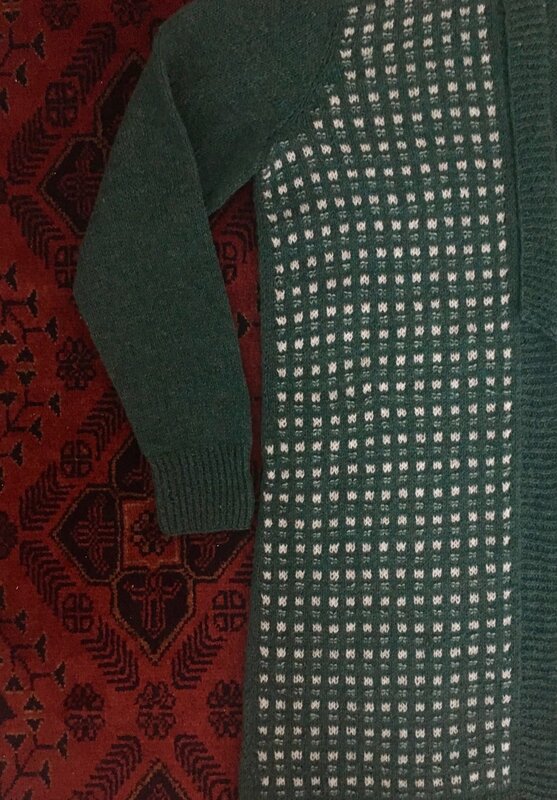 Since it was a big piece, I laid the cardigan down on a rug in the apartment where Eero and I were staying. This was purely coincidental but it looks like this rug could have been right at home in the background of Pom Pom's final photoshoot. Getting ready for the post. The final treatment of Issue 22 is stunning but that's no surprise. I just assume that everything Juju touches becomes a feast for the eyes. I had seen a few of the final pictures online but was even surprised when my copy arrived in the mail. The colours seemed to be even brighter and richer in print. Like always, this issue is filled with great articles and a delicious looking hot toddy recipe. One of the articles is about Merchant & Mills and the concept and development of their beautiful haberdashery shop. I haven't had the pleasure yet to visit their shop in Rye, UK. However, I have come across their stand at the different Knitting and Stitching Shows I have worked at in London. I thought it was fitting that Barbicel was paired with their Camber Shirt since I've made one for myself and a few of their Camber dresses which were staples in my summer wardrobe. I had a birthday last weekend and wanted to do something special to celebrate with my followers. I have a copy of Issue 22 to giveaway! As of this weekend (Sept. 15-17), I'll be running a giveaway on my Instagram. All you have to do is follow my account, like the photo and leave a comment below. Leaving a comment on the blog will get you an extra entry. Come find me at @fiona_alice_ to enter and good luck!